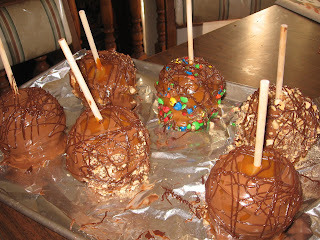 I was inspired by Kristen's friend who made gourmet carmel apples a few years back (Kristen shared them with us). They were so good and I have always wanted to try making them on my own. So ours are dipped in carmel and then dipped in nuts, or m & m's or Snickers, and then have milk chocolate and dark chocolate on them. We haven't eaten them yet, but I'm sure they will be really good. How can you go wrong with carmel and chocolate? You can't. I also took the kids out to lunch, which we never get to do when they are in school. We had a good time. Tomorrow John actually has off with his 9 day on 1 day off schedule, so we might go hike to the Y, since the girls have expressed interest in doing that. They may wish they never suggested it after they are half way up though. I guess you have to hike the Y at least once when you live in Provo/Orem. Also, John plans on putting up the Halloween stuff in the yard tomorrow. More pics will follow on that I'm sure. Those apples look so good! Of course we miss you too! I'll try to call you tomorrow. Love ya!